All parents know that snack items like chips, doughnuts and soda pop are bad for their children while fresh fruit is always a good choice. But what about those items you think are healthy? Not all snacks for toddlers are the same when it comes to nutritional value. Granola and cereal bars have long been a popular choice with both parents and toddlers. They’re small, convenient and healthy, right? Not necessarily. Many cereal and granola bars contain high amounts of sugar and calories and are often made with hydrogenated oil, which can clog arteries. However, there are healthier versions out there, so make sure you check the labels when you shop. Another convenient item for parents are prepackaged snack or lunch kits. These kits usually come with processed meats and crackers that contain lots of sugar, calories and salt but very little nutrition. It’s best to avoid these kits altogether or serve them very rarely. Many toddlers are given fruit drinks and punches as a healthier alternative to soda pop. What you may not realize is that these drinks are basically the same as soda. Juices that are labeled as “fruit drink” or “fruit punch” have high amounts of sugar in them but very little real fruit juice. Instead, go for juices that are labeled as 100% real fruit juice. Fruit snacks and candies can also be misleading to parents since they contain the word fruit in their name. Unfortunately, this “fruit” usually means the product has been artificially flavored to have a fruity taste. And, again, the products tend to have high amounts of sugar making them bad for your toddler’s body as well as their teeth. Why not buy some fruit leather made with 100% real fruit instead? 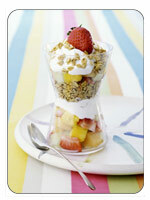 Here are two snack items that you may not have realized were unhealthy: muffins and fruit-on-the-bottom yogurt. Muffins tend to be high in fat, sugar and calories while fruit-on-the-bottom yogurt is usually made with jam that is high in sugar. Of course, there are low-fat or fat-free options for both of these items, so look to buy those instead. There are many delicious and still nutritious snacks that many toddlers love. Simple items like cheese, chocolate milk, and low-fat yogurt are all excellent sources of calcium. Cheese also provides a good source of protein for your toddler. Nuts and dried berries can be a great choice for little hands. Dried cranberries are a good source of fiber and vitamin C. Trail mix is also a good choice, just be sure to serve a small amount since all those nuts can make it high in calories and (heart-friendly) fat. Vegetables served with a low-fat dip are always a popular snack with toddlers. They love finger foods that can be dipped while you love that they are eating their vegetables. To get them to eat their fruit, serve them a frozen fruit bar. It looks like a popsicle but tastes much better. Plus, they’re loaded with vitamins, like A and C, and are low in fat and calories. If your toddler is demanding something not so healthy, like chips, then serve them some baked chips or tortillas, which are not as high in fat. You can serve both of them with a bit of salsa to make it even healthier. Learn some more tips to feed that picky eater. Another healthy treat disguised as junk food are multi-grain toaster waffles. Put some low-fat syrup or jam on them and your toddler will never know the difference. Mini-pizzas are an excellent snack choice for your toddler. Not only can your toddler get involved by choosing their own toppings, but the mini-pizzas can also pack a nutritional punch which is always good. To make these, just take half of a multi-grain or whole wheat English muffin, put some tomato sauce, cheese and whatever vegetable toppings your toddler wants on it. Pop it into the toaster oven or oven until the cheese is melted. To make the muffin a bit crispier, you might want to toast it before you put any toppings on. Here’s a great, healthy recipe for toddlers: smoothies! If you find it difficult to get your toddler to drink enough milk or eat enough fruit, then throw the two together into a blender. You might want to add some yogurt to make it a bit thicker and up the calcium quotient at the same time. An old classic with toddlers is ants on a log. This snack is easy to make and fun to eat. Just take some celery, spread a bit of peanut butter (a good source of protein) or low-fat cream cheese on it and then top it all off with some raisins. Check the label. You want to buy snacks that are low in fat (especially trans-fat), calories, sugar, and hydrogenated oil. Also check to see if the item is made with whole wheat, whole-grains, or real fruit, all good choices when it comes to snacks. If you want an easy way to control the contents of your child’s food, then do some baking. Items like muffins and banana bread can easily be frozen and pulled out later for a yummy snack. While you could buy these snacks, when you make it yourself you can decide just what you do and don’t want going into the items. Try to give you toddler at least an hour between snack time and mealtime. Since they don’t have big appetites to begin with, eating too close to lunch or dinner may cause them to eat very little when you want them to eat a lot. This is also why it is important to make sure that their snacks are healthy and nutritious. If they do end up eating less at mealtime, at least you know they got some good nutrition at snack time. Share snack time. Sitting down with your toddler for a snack is a nice way to take a break from the day and adults need a snack just as much as a toddler! Also, since young children may have more problems with chewing and swallowing properly, encouraging them to sit down and eat with you nearby helps to cutback on any choking risks.